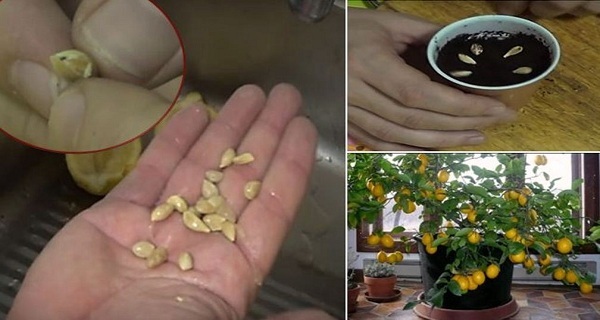 If you love lemons, this article will teach you how to grow a lemon tree from seeds. You need a lemon, which you can buy from the supermarket. Of course, it is better to choose organic. Because lemon trees are usually grafted, it means that a wild lemon tree will be grown from the seed. You will have to use it as a base on which to graft the fruit-bearing species if you want to get abundant and large lemon fruits. Cut the lemon with a knife and take out the seeds. If you cut a lemon seed with a knife, you cannot use it. Wash them with water to remove the pulp around them. Divide each seed in half using your fingernail. Bury the seeds in a small bowl and water the soil. Then cover with a paper towel to keep moist. When the plants get bigger, place them in the ground. Lemon is a superfood. They are so useful for many things, no matter if you add them into water or use their peel. Growing your own lemons should not be ignored. Lemons are rich in Vitamin C, which is in the form of citric acid. It has been proven to improve the absorption of calcium by the digestive system. They contain unique flavinoids and are high in antioxidants, which can combat free radicals and cancer cells. Lemon’s antioxidants also help with providing vascular protection and boosting the immunity. Moreover, lemons help in treating urinary tract infections and many problems with digestion. Also, it can be used as a natural antiseptic on cuts. Because this fruit is rich in Vitamin C, be careful with your daily consumption of Vitamin C in order to avoid intestinal discomfort and diarrhea.